Toilet and shower block with self-contained disabled unit. Recycling: Oil, Batteries, Filters, Glass, Tin, Plastic Bottles and Paper. Local supermarkets, shops, pubs and restaurants are only a short walk from the Dock. Access via 2 metre flap gate that is operated during the Summer period (1st April – 30th September) between the hours of 07:00 – 23:00 and during the Winter period (1st October – 31st March) between Sunrise and Sunset only. 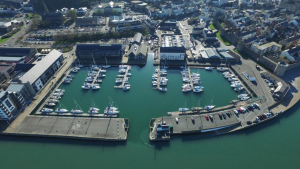 The Victoria Dock is ideally situated within reasonable distance for any of the main visitor attractions of North Wales such as Snowdonia National Park, Snowdon Mountain Railway, Welsh Highland Railway, Caernarfon Castle, and Electric Mountain Hydro Scheme, along with many other places of interest. 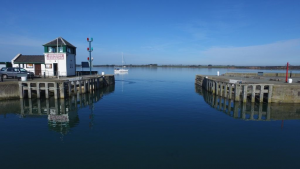 If you are travelling up or down the West Coast of Wales then you cannot miss out the Royal Town of Caernarfon and the Menai Strait as a destination to visit either by Sea or Land. The Victoria Dock, situated in the historical Castle town of Caernarfon at the Southern end of the Menai Strait, was first built in the 1860s and intended for the import mostly of timber from Scandinavia. At around the time of completion the railway had arrived and following a period of decline in commercial shipping the Victoria Dock ceased to exist commercially. 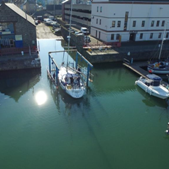 In 1997 the Victoria Dock was purchased by Gwynedd Council who developed it into the Victoria Dock Marina that is operational today. The Menai Strait is the stretch of water that separates the Island of Anglesey from the coast of Gwynedd and is as dramatic and picturesque as any other navigable waterway and anyone who has travelled through the Menai Strait will assure you that it is an easy passage to make if you have your correct timings. Passage information is willingly given by the duty Dock Master should you require.